If you don’t live in Louisiana, you might not know that we’ve got a big carnival going on right now. Parades, marching bands, crazy costumes, and (of course) beads are daily sightings for the two weeks preceding Mardi Gras. 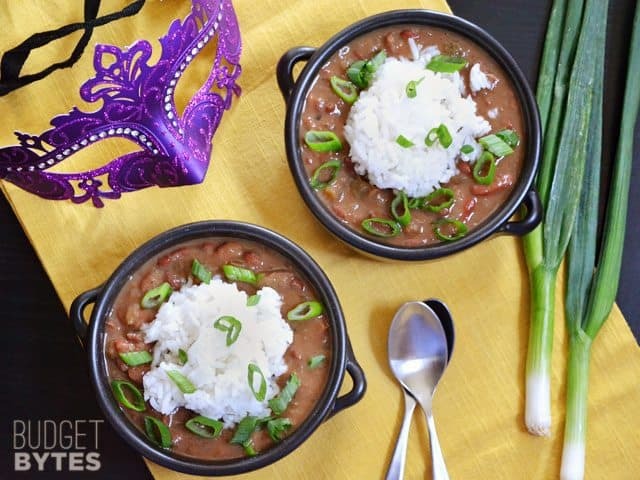 It’s all gotten me in the mood for some classic New Orleans food—Red Beans and Rice! 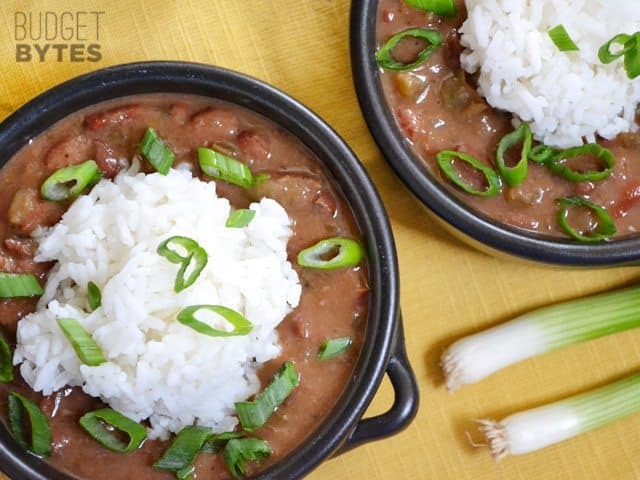 I made a classic version of Red Beans and Rice way back when this was just a baby blog, so I thought it was time to revisit this deliciously filling and inexpensive dish. While I absolutely looove pork products, I thought it would be fun to try a vegan version. To make up for the loss of andouille sausage’s smoky flavor, I added a heaping dose of smoked paprika (that stuff is magic!). Making sure there was a healthy amount of herbs and spices also helped keep the batch flavorful. A sprinkle of fresh green onions on top adds a final oomph of flavor and then I’m in red bean heaven. It’s so filling, so flavorful, and so real. The recipe is simple and requires only good, simple ingredients. That’s the way I like to eat. Keep in mind that this is not a fast dish. The longer you cook it the better it gets. I cooked mine for 3 hours, but you don’t want to go any less than 2 hours, or else your beans won’t be soft. Also, I soaked my beans over night, so you’ll want to plan this at least a day ahead. It’s worth it. Promise. As an afterthought, I stirred a spoonful of coconut oil into one of my bowls and it added that lovely, velvety, rich flavor that you can only get from saturated fat (usually provided by the pork). So, if you still feel like you’re missing that pork derived richness, try adding a lil’ coconut oil. The night before, Place your beans in a large pot and fill with enough cool water to cover the beans by a few inches. Place the beans in the refrigerator to soak over night. 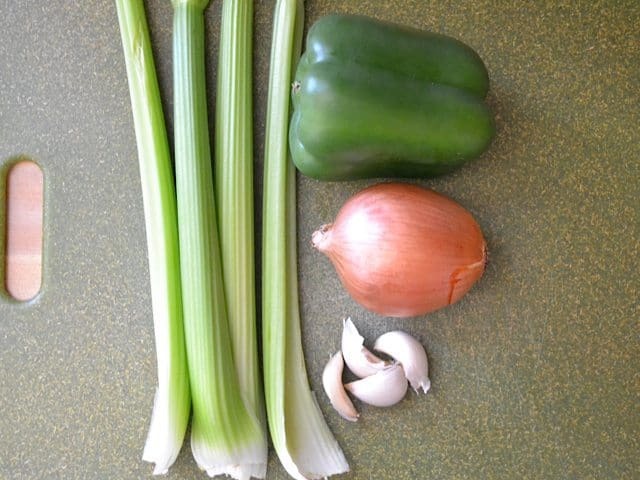 When you're ready to cook, finely dice the celery, bell pepper, and onion, and mince the garlic. 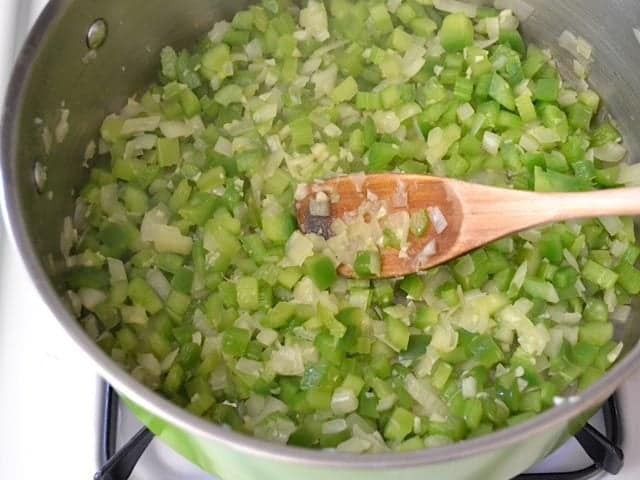 Cook the celery, bell pepper, onion, and garlic in a large pot with the olive oil over medium heat until softened (5-7 minutes). Drain the soaked beans in a colander and rinse with fresh, cool water. Add the rinsed beans to the pot with the vegetables. Also add the vegetable broth, thyme, oregano, bay leaf, smoked paprika, some freshly cracked pepper, and a pinch of cayenne pepper. Place a lid on the pot and bring it up to a full boil over high heat. After it reaches a boil, turn the heat down to low and allow the pot to simmer for at least two hours. Make sure the pot is simmering the entire time, increasing the heat if needed. Stir the pot occasionally to make sure nothing is sticking to the bottom. Keep the lid in place the entire time to keep the beans from drying out. After two hours (or longer if desired) the beans should be soft and tender. Mash some of the beans against the side of the pot with the back of a spoon. This will thicken the pot and make the classic, creamy texture of the dish. Remove the bay leaf and allow the pot to simmer for about 30 minutes more (after smashing) to help it thicken. 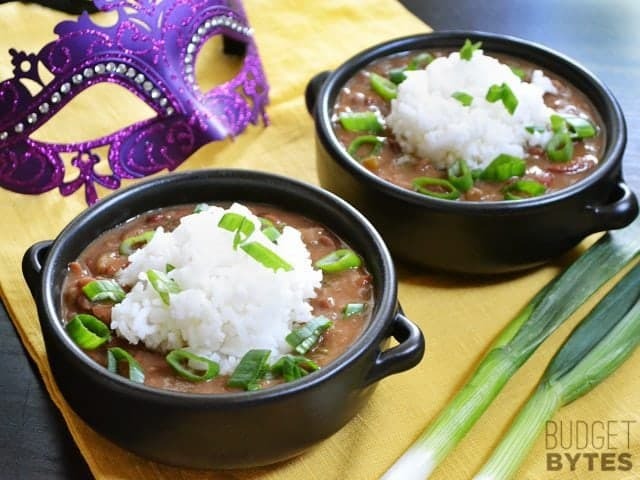 To serve, add a scoop of red beans to a bowl and top with a scoop warm, cooked rice. Sprinkle sliced green onions over top and add a dash of hot sauce if desired. The night before, soak one pound of red beans in the refrigerator. 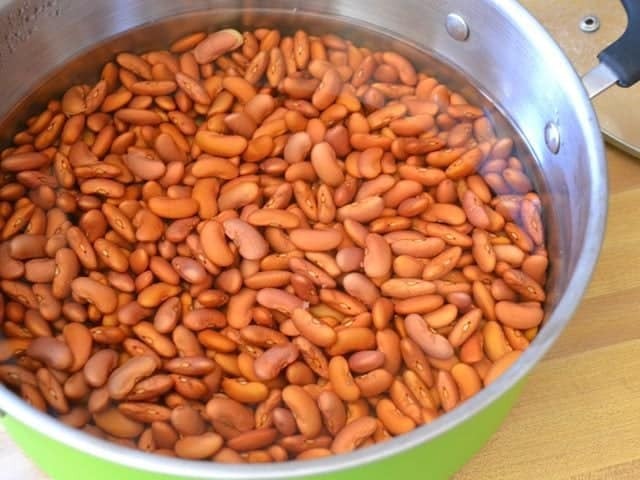 Add the beans to a large pot and then add enough cool water to cover the beans by about a few inches (they’ll absorb water as they soak, so make sure to enough water to keep them covered as they expand). If you didn’t presoak your beans, you can use the “quick soak” method, but that still takes at least an hour. When you’re ready to begin, finely dice four stalks of celery, one bell pepper, one onion, and mince four cloves of garlic. Sauté the vegetables in a large pot with olive oil over medium heat until they are soft (about 5-7 minutes). Drain the soaked beans in a colander and rinse with fresh water. Add the rinsed beans to the pot with the vegetables. 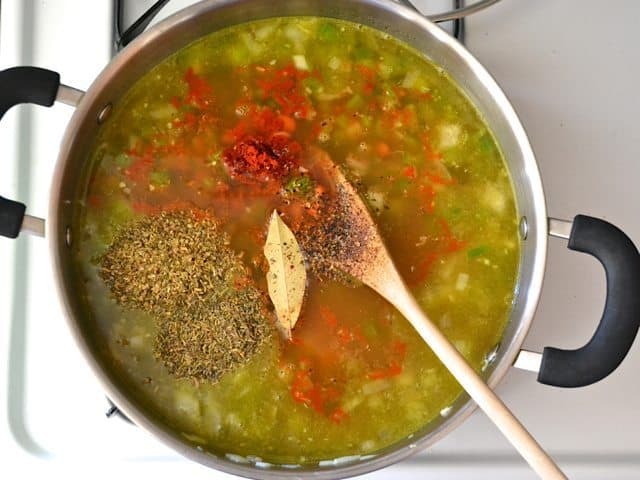 Also add 6 cups of vegetable broth, 1 tsp thyme, 1 tsp oregano, 1/2 Tbsp smoked paprika, 1 whole bay leaf, some freshly cracked pepper (about 10-15 cranks of a mill), and a pinch of cayenne (I like it a little more spicy, so I added 1/4 tsp). Give the pot a good stir, then place a lid on top and bring it up to a full boil over high heat. Once it reaches a full boil, turn the heat down to low and let it simmer for at least two hours (with lid), stirring occasionally. Make sure it’s simmering the whole time, turning the heat up slightly if necessary. After a minimum of two hours, the beans should be soft enough to smash with the back of a large spoon. Smash a good portion of the beans until they begin to take on a thick, creamy consistency. You could use an immersion blender instead, but just make sure not to purée the entire pot. You want some whole beans in there. Let the pot simmer for another 30 minutes or so after smashing the beans to let it thicken a little more. 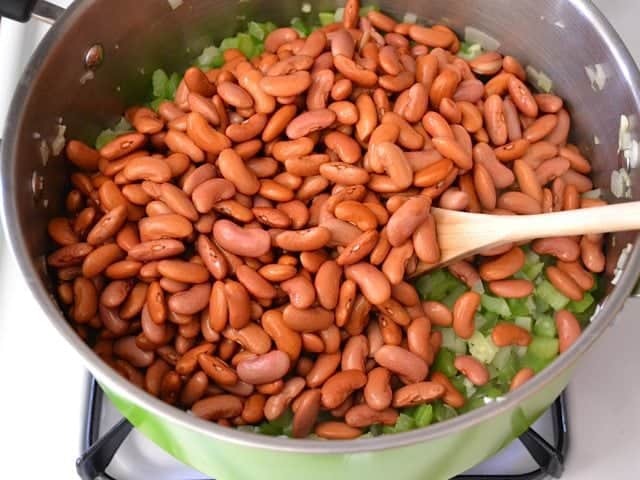 Serve the beans with a scoop of warm, cooked rice over top and a sprinkle of fresh, sliced green onion. A splash of hot sauce is also a nice touch – the vinegar in the hot sauce helps bright everything up and gives a kick of flavor. Can I use this same recipe and seasonings for most beans? Some including Pinto and Kidney? Yes, absolutely. :) It’s great with white beans, too. 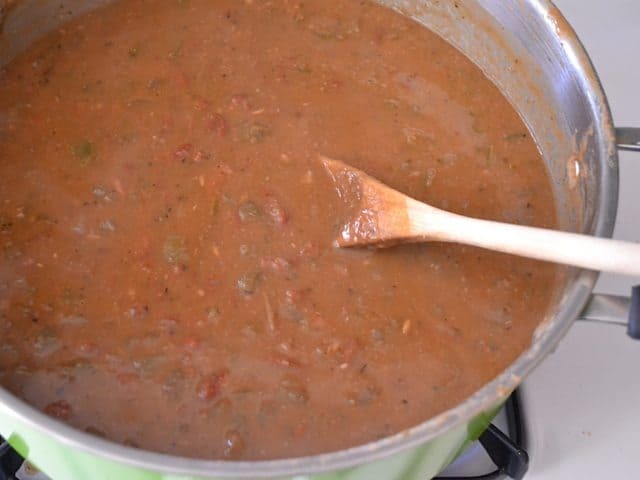 The store didn’t have red beans today :( I’ve made this recipe before and absolutely love it. I bought kidney beans to try and sub. Do you think that is an ok sub that will be pretty similar? Following up on the coconut oil: would you suggest cooking that into the pot or adding in before serving? Made this in the IP… delicious! Did not soak the beans so I did it on manual 50 minutes with a natural release. I just wanted to throw it out there that I have made a slow cooker version of this recently, and it was great! I followed steps 1-3 exactly, but at step 4 I transferred everything to the crock pot after the beans were at a rolling boil for about 15 minutes. I used about 12 oz of dried beans instead of one pound, but kept the same amount of liquid so that the beans wouldn’t dry out in the crock pot. They stayed in the crock pot all day for about 10 hours, and they were perfect for our Monday night red beans get together. I sauteed some andouille sausage on the side for the carnivores as well.